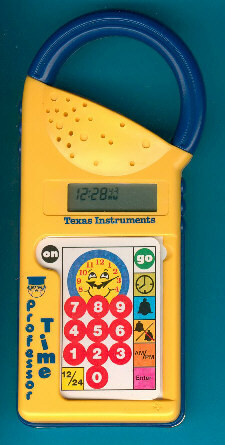 This educational toy for youngsters tells you to read the time and to do some simple calculations with quarter hours. The keyboard uses different paper overlays for each game. An additional feature is a simple digital clock with alarm function, the picture shows the corresponding keyboard overlay. This product sold in Europe is identical to the Time...To Go! sold elsewhere. Compare this product with the green Math...To Go! and the red Words...ToGo! using similar housings. The Professor Time is featured in the Texas Instruments France SA leaflet Magiques et Intelligents dated 1991 and the Texas Instruments Deutschland GmbH leaflet Spielen macht schlau dated 1991.